If you find yourself in downtown Durham on a Saturday make you way down to the Central Park. For four hours you can find a match made in heaven. 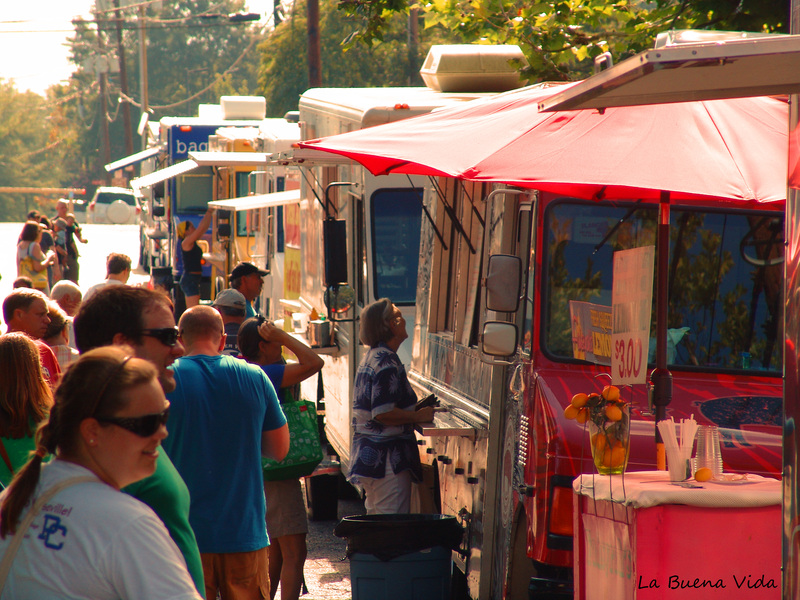 Work up an appetite while you browse and buy fresh produce at the farmers market then hop across the street and feed your hunger with a number of food trucks lined up and ready to serve. When I travel, I always talk about how motivated I am to get back in my kitchen and key off various things I have tasted overseas. 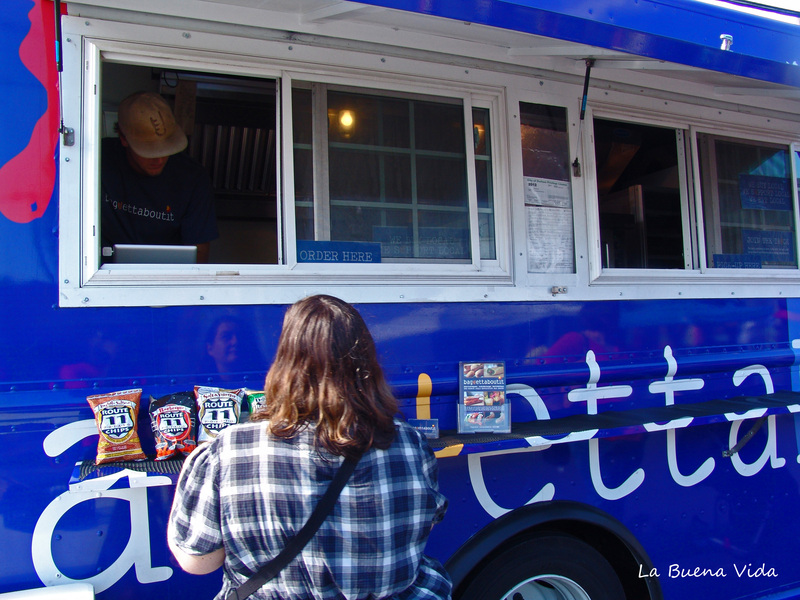 Well a memory of a lunch in Switzerland was the motivation behind this truck bringing their own twist to european style sandwiches. Bagettaboutit offers a selection of six different sandwiches with names like U TALKIN TO ME (hot italian sausage and basil tomato vinaigrette), SOUTH OF THE BORDER (chorizo, habanero hellfire sauce) U BETCHA (Bratwurst, beer garden mustard) NU JERSEY TURNPIKE (sweet italian sausage, roasted red pepper sauce) and UNITED NATIONS (chicken chipotle sausage and chimichurri sauce). You can also mix and match the sausage and sauces to make your own. Since I have a weakness for tzatziki sauce I went with the IT’S ALL GREEK TO ME (chicken spinach sausage, and tzatziki sauce). The sandwich came back to me in the brown paper bag in which my order was written on and I was immediately surprised and happy with the way the sandwich was presented. 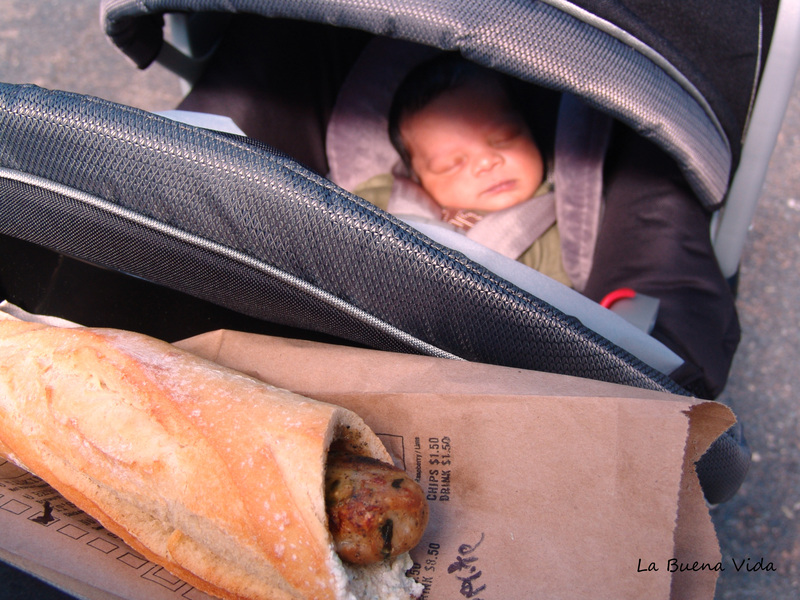 The bread had been dug out of the middle of the baguette and the sausage placed in the end. This presentation made this incredibly tasty sandwich easy to eat. The sausage was great, the sauce was right on point all snuggled inside a fresh and crusty baguette. Next on my radar SOUTH OF THE BORDER.